Weather was amazing and the proximity of the lake for boating, fishing and swimming gave fun for all. The kids club always had fun activities to entertain the little ones and the pool and slide gave welcome relief from the heat. Lovely, quiet pitch with tranquil view of the lake. The lake is brilliant, good bar, nice evening visits from the local producers and chateau's, Great kids club. The pitches could do with more shade, but it was exceptionally hot. Clean. Friendly and helpful staff. Quite a lot of flies. The hosts went out of their way to make our stay enjoyable and comfortable, despite occasional poor weather during our stay. On sunny days, being by the pool was great and it looked like the poolside area was being extended to increase the capacity of sun loungers. Staff were friendly and helpful. Nothing really that we disliked. If I had to be fussy: the bar doesn't serve food every day in the low-season, and you'll need a car to make the most of the area. Good, quiet pitch. Access to electricity and close to toilet & shower block. No serious dislikes about the accommodation. Simple plot as you would expect, this plot is not lakeside. The situation of the site is excellent. The bar and restaurant were nice and the staff very friendly. Sanitaires are cramped and old. Lakeside block was closed during final week. The pitches by the lake are huge and convenient for the fishing. Pitches were very uneven with very little shade. The lake and the wine! The hundreds of dead insects left on the floor in the public washrooms. We were there end of season though so perhaps this is not usual. Nice large pitches, great pools, lake, activities. Very helpful staff. Wash facilities, fairly small and could have been a little cleaner and the lights could be on more often for longer? This is a fantastic site ran by a family for families. If you are looking for somewhere to relax and enjoy the peaceful evenings this is the place, there is entertainment on in the season but from 11pm it is quiet time. Staff are all friendly. The local village has a small Carrefour Express open everyday. The lake is a great place to mess about on the water in kayaks or dinghys. Pool complex is great and if it gets too busy there's the beach. Pitches are generous size some are huge. Loved the variety between the pool, slides, lake for swimming and jumping off the pier and the lake for fishing - kept the kids entertained. reception of wifi an mobile reception where bad all over the camping. This could be improved by placing mobile phone signal repeaters and wifi repeaters. Lake for swimming and boating. Pool with slides. All very suitable for our kids aged 4-8. Staff unbelievably helpful. The entertainment was a little noisy, but stopped at 10. And most of the tourist spots are a reasonable distance (an hour or more) from the site - though we were happy on site most of the trip. Blasting music on some nights, even though there was nobody in the club house. Why bother??? People that go to these kinds of campsites aren't looking to party all night and spend the whole night drinking at the bar. The site would be a lot better without it! Small safe sight. The children (6 and 14) made friends and where safe to go and play with the friends on there own. The pitches where a good size. One of the toilet blocks was very new the other could do with an upgrade. Always very clean and cleaned about 3/4 times a day. The pool was lovely and it was nice to have a choice between the pool and the lake. We had a very relaxing and enjoyable stay. All of the staff where helpful, spoke English, French and Dutch and worked very hard to keep the sight running, providing entertainment and activities for the campers. The region of the Dordogne is very pretty but mostly consists of vineyards. 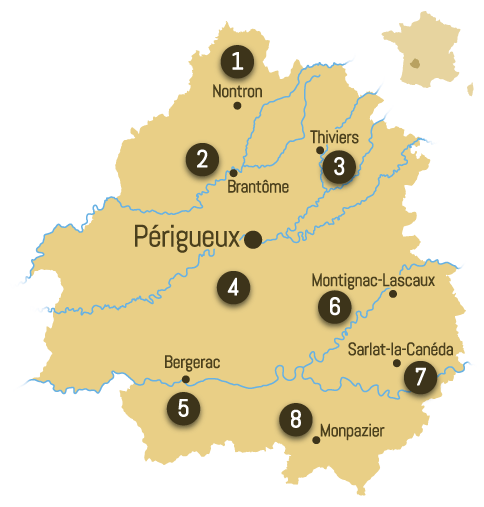 There were places to visit but most of these places where in the east of the Dordogne. We stayed in a tent, the pitch was a good size. If I could chose a pitch I would have asked for a lakeside view. The kids disco each night was very poor, the same music played each night and got very tiring. The evening entertainment needs improving also to appeal more to adults. The pools are great, clean and safe. The lake is perfect for older children. We loved our lake view camping pitch and would definitely recommend the extra cost which gave us the fantastic view. The pool was perfect and the kids (aged 4 and 2) enjoyed the slides and small pool. The pool was always very clean and well maintained and never overcrowded. The children loved the play area and we enjoyed the wine tastings while they played early evening. The beach was nice and clean. Our pitch was perfect - fantastic location next to the lake and the trees gave us some shade when needed. Amazing facilities on site. Great staff and very helpful when we needed them for an incident. Can find no fault with anything! Large pitch with shade. Perfectly placed between both pools and lake. Fantastic campsite for young children, with 2 pools and a lake with sandy beach. Laid back atmosphere. Small, clean, friendly camp site. Large pitch close to lake. Facilities were excellent, well looked after. Not much to do in area.
. Pool was cold! No shop. Pitch had lots of holes and tree roots. Electric point access was across another pitch. Small site, well maintained. Lovely pool area with bar and cafe, toilet facilities were cleaned regularly. Lovely location. Not enough facilities for the amount of people, site was at capacity and toilets, showers and pool were all overstretched. Quiet after 10pm rule was not adhered to, and I'm usually OK with that within reason but we had particularly noisy neighbours and it got a bit tiresome every night. On the whole, very good indeed, would definitely recommend! A great family campsite, not too big and with a great swimming lake with sandy beach as well as pool, with slides. Great to have both options for swimming, we actually preferred the lake and meant we could avoid the pool at busy times. Staff were all really helpful and friendly. Lakeside pitch was spot on. Really large pitch and having water on site was useful with a large motorhome. The village was a nice short bike ride away so perfect for young family. The children also loved the pony rides. Not enough shower facilities, even in block two which looks quite new, there are only two showers for ladies. Also, more washing machines would be handy as some people appear to do multiple loads and there was no chance of us getting use of the machine. Nice large pitch with great view and access to the lake. Great Location, plenty of space, nice and quiet. The main shower and toilet facilities although acceptable and clean could do with an upgrade. The staff went above and beyond to make us feel welcome and our stay enjoyable. I can't recommend the campsite enough. The accommodation was excellent and very clean. Only suggestion would be to put a fan in the cottages for really hot and still evenings. The grounds were immaculate. Facilities brilliant. Friendly and helpful staff. Winery with a children's corner 400 metres from the campsite. Small village within walking distance with everything you need. Perfect spot for a family break. very nice /quite/ my 9 year old granddaughter enjoyed it/ loved the pool. The food was not good and the drinks expensive. Asked for the broken deck chair to be replaced by the owner on the first day of arrival and still waiting? we did asked him twice. The grass needed cutting. otherwise no problems. when we arrived the cottage was dusty we swept it out, washed the dirty cups and plates in the cupboard and cleaned the cupboard this had been missed by the cleaner. I did tell the owner when leaving as I paid 60 euros for the cleaning on departure. Great site, well kept. Very happy with the van, very clean. Things to do for small daughter and excellent pools. Joris on reception spoke great English, had local knowledge and was extra helpful. Very clean and comfy beds. Modern and in excellent condition. Enjoyed sitting out on the decking. Tiny bit cramped at times. Would have liked a comfy sofa area.